The federal government gives each of us an allowance to gift anybody $15,000 per year without incurring any gift tax. This $15,000/year replenishes every year, and it’s $15,000 per person. So, theoretically, I could gift every person that I know $15,000 today, and then another $15,000 next year and the year after, and there would be NO gift tax. What most people don’t realize, is that there’s a second allowance of $11.4mm! In other words, let’s say that I want to give you $115,000. That’s $100,000 more than what I can give you out of my $15,000 annual bucket. That’s not a problem at all because I also have the $11,400,000 bucket. The $11.4mm bucket is called my “Lifetime Exclusion.” If I use any of it during my lifetime, I simply reduce my estate tax exclusion by that amount. So in our example, if I gift you $115,000, I would take $15,000 out of my annual bucket and $100,000 out of my lifetime bucket. My annual bucket replenishes each year. But my lifetime bucket does NOT replenish. 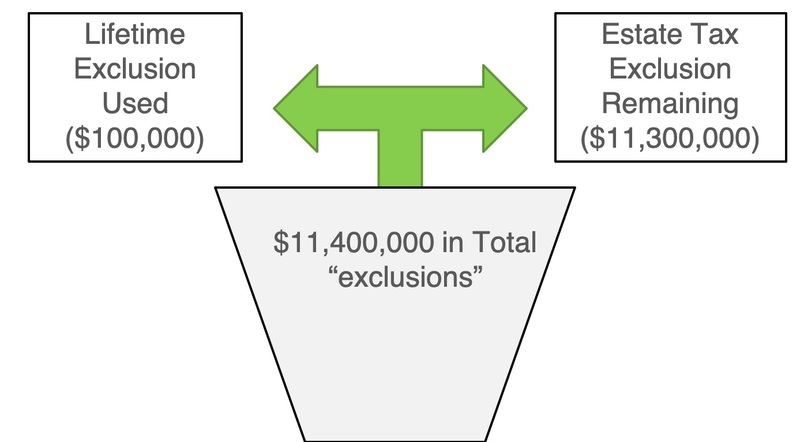 In fact, I must reduce my lifetime bucket by $100,000, so now my lifetime exclusion is “only” $11.3mm instead of $11.4mm. Now, if my estate is less than $11.3mm, this would not be a problem at all, because my heirs would have no estate tax anyhow. However, if my estate is more than $11.3mm than my heirs would have to pay estate taxes on anything inherited above $11.3mm. In other words, the lifetime exclusion bucket is used for both gift and estate tax purposes. So every time I use it to not pay gift taxes, I’m also reducing my estate tax exclusion… that’s how and why the gift tax and the estate tax are related to one another. You don’t have to be related to use either of these buckets. You can gift $15,000/year to a complete stranger and you would have no gift tax. You can also gift money to a complete stranger using your lifetime exclusion bucket, and you would have no gift tax. Now, everything we just talked about applies to the person GIVING the gift. What about the person RECEIVING the gift? Well, here's some more good news: there is no tax to the gift recipient. One thing to keep in mind about the lifetime exclusion bucket is that the amount changes each year. In 2019, the exclusion is $11.4mm, but it is scheduled to go up in the years ahead because it is indexed to inflation. 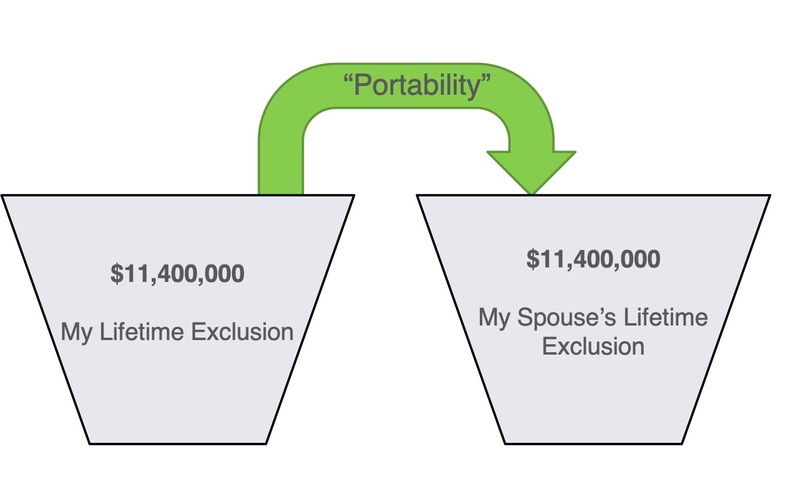 Also, keep in mind that I can “port” over my $11.4mm to my spouse if I’m married. So technically, a married couple could have a total joint exclusion of $22,800,000! Therefore, if you are married and your net worth is less than $22,800,000, there is absolutely no reason whatsoever for you to concern yourself with the gift tax. That’s because even if you gift your entire net worth during your lifetime, you would pay $0 in gift taxes and your heirs would pay $0 in estate taxes. That’s why the gift tax is really a non-issue for most people! 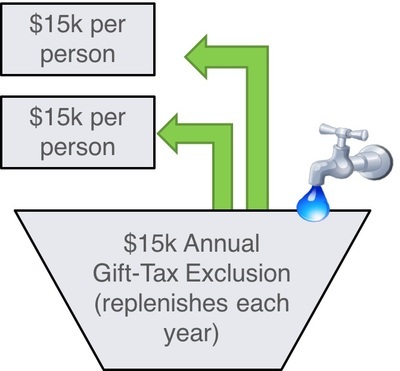 If you're using the $15,000 annual bucket, the gift doesn't need to be reported to the IRS if you follow the proper procedures. However, if you're using the $11,400,000 lifetime bucket, you would need to file a gift tax return with the IRS (even though no gift tax would be due). This is done to simply notify the IRS that you're using part of your gift/estate tax exclusion. Also, make sure the checks are written by the specific individuals who are giving the gift. In other words, if mom is gifting you $15,000, and dad is also gifting you $15,000, you'll need two separate checks: one from mom and one from dad. We might also have to "source" these funds from a mortgage underwriting standpoint. Please check with me before you do anything so that we can discuss the specific details of your situation and make sure this is all done properly. Contact me using the info below so we can get started! PLEASE NOTE: THIS LETTER AND OVERVIEW IS PROVIDED FOR INFORMATIONAL PURPOSES ONLY AND DOES NOT CONSTITUTE LEGAL, TAX, OR FINANCIAL ADVICE. PLEASE CONSULT WITH A QUALIFIED TAX ADVISOR FOR SPECIFIC ADVICE PERTAINING TO YOUR SITUATION. FOR MORE INFORMATION ON ANY OF THESE ITEMS, PLEASE REFERENCE IRS PUBLICATION 559. ALSO, THIS ARTICLE REFERENCES THE FEDERAL GIFT TAX. YOUR STATE GIFT TAX LAWS MAY BE DIFFERENT.